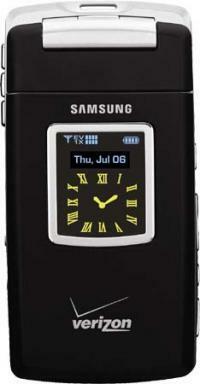 "it's the first phone in the United States to boast a 3.2-megapixel camera, trumping the recently lauded Nokia N80. It has an autofocus feature, zoom, and plenty of imaging options. You can choose from five picture modes (auto, portrait, landscape, micro, and night), three quality settings (economy, normal, and fine), and five resolutions (2,048x1,536, 1,600x1,200, 1,280x960, 1,024x768, and 800x600). You can adjust the brightness, white balance, color effects, and ISO settings. There's also a multishot mode and a self-timer, and you can change or turn off the shutter sound. Many of these options are also available to you in camcorder mode, although you get a choice of only two resolutions (320x240 and 176x144). You can capture up to an hour's worth of video with sound." "Bundled with additional camera settings, features include Effects (Black and White, Negative, Sepia, Emboss, and Sketch), Timer (3, 5, and 10 seconds), Shutter Sounds, and 25 preinstalled Frames. Built-in flash is noticeably missing. ... However its still photo capabilities are able to make decent photo prints. ... Compared to other camera phones, the T609 performs much as expected. Being designed as a mid-level device, the 1.3-megapixel camera is mediocre, on par with other devices on the market." "The Samsung Digimax L50's good looks and small size make it a welcome companion, and its big 2.5-inch color LCD monitor makes it an entertaining one, too. Though primarily designed for the point-and-shoot consumer interested in both style and portability, the L50 has some useful audio and video features as well. 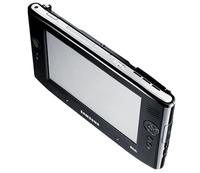 The 5.0-megapixel CCD captures high resolution images usable up to 11x14 inches, but they're really sharp only to 8x10. The L50's 2.8x optical zoom lens covers the most common shooting uses. We did have a few quibbles with it, mainly its enigmatic menuing system. It was a little slow focusing on kids indoors and out, unfortunately, and its low light and flash performance were weak. Though chroma noise and detail held together at high ISO, color washed out noticeably, making for a sickly look in photos of people. Still, we enjoyed shooting with the Samsung L50. It's not a Dave's Pick, but it is an impressive showing by Samsung in the subcompact arena. " 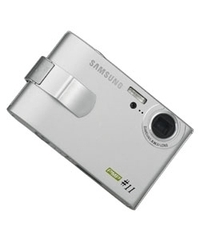 "the MM-A920's 1.3 megapixel camera is capable of taking decent quality still photos as well as video clips. While the camera's automatic white balance sometime tends to produce photos that are a bit cool looking, temperature wise, it is otherwise pretty accurate in most situations. The camera also has a fairly wide focus range that will let you capture most situations nicely, as long as the subject is not too close to the phone. Video clips of up to 30 seconds in length can be recorded. Both videos and still photos can be easily uploaded to your own gallery page on the Sprint website, or can be copied over to your PC by using a memory card reader. While the included USB cable can't be used for accessing your photos directly from the phone, it can be used with a PictBridge compatible printer for direct-from-phone printing." While I do wish that Samsung's MM-A920 had better reception, since I live in a weak Sprint area, and had better voice dialing performance, since I am just lazy that way, I still think it is a very fun, usable handset. I like all of the multimedia capabilities, and am reasonably impressed with the user interface and data functions it offers. With a few tweaks here and there, it could be a truly great handset. But as it stands, it is still a good one. As such, I give it a "Recommended" rating. The Q1 is actually a PDA, Tablet PC, portable multimedia player, GPS system, and storage device all rolled into one. 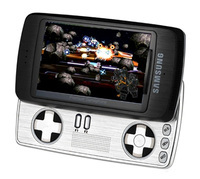 Samsung makes much of the machine's multimedia capabilities. It's got SRS' TruSurround sound 3D audio system which operates through the device's twin speakers, and there are a pair of microphones implemented as an array to help reduce background noise. Since the Q1 runs Windows XP, it's got Windows Media Player 10 with its wide array of supported audio and video formats, and the machine ships with Samsung's own instant-on media playback software. Samsung does it again earlier this week they introduced a cellphone with 8GM of storage and now they continue to prove that they are the best camera phone maker with the introduction of the SCH-B600 (translated to English) with a 10-megapixel (with 3x optical/5x digital zoom) camera. 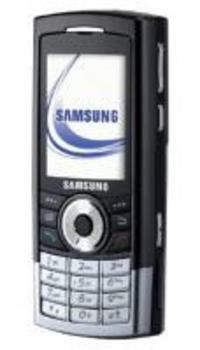 The new Samsung SGH-i310 cellphone comes with a whooping 8GB of storage, the highest capacity on a cellphone that I've seen. 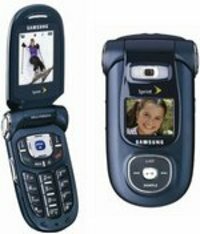 Plus this Samsung comes with a 2-megapixel camera with flash, TV-out, built-in dual-speakers, Bluetooth A2DP support, microSD slot and a new Windows Mobile 5.0 OS. 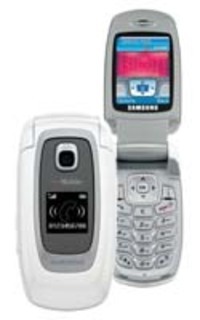 The Samsung SGH-i310 will be showcased at CeBIT from March 9 to March 16, and is expected to be available for sale during the second half of the year. Samsung’s new Digimax L85 and L60 digicams will debut at the 2006 PMA in Orlando later this month. 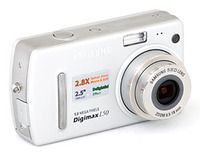 The Digimax L85, shown black, features an 8.1MP CCD, VGA video recording at 30fps, 5x optical zoom (8x digital), 2.5" TFT LCD display, USB 2.0, A/V-output, PictBridge printing, 32MB of internal memory, SD memory card storage, and Li-ion rechargeable battery - dimensions are 110 x 60 x 29mm and the camera is expected to be available this month for around $472 USD. 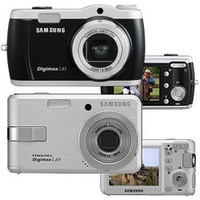 Samsung has unveiled their DIGIMAX i6 , the first digital camera with PMP functions. This 6MP camera has 45Mb of internal memory and can read a variety of video files and MP3 files, think of it as a portable media player. The design is quite cool and the device is super-slim (18.5mm) which is small enough to fit in your pocket. No word yet on pricing or availability so check back later and we will keep you up-to-date.